Clan-Gifts.com - Scottish Clan Names - Flower of Scotland Store! - National emblem of Scotland! The Flower of Scotland - or Scottish thistle - has long been recognised as the much loved national emblem of Scotland. According to legend, this "guardian thistle" has played its part in the defence of the ancient realm of Scotland against a night attack by the Danes, one of whom let out a yell of pain when he stepped on a prickly thistle, thus alerting the Scottish defenders. 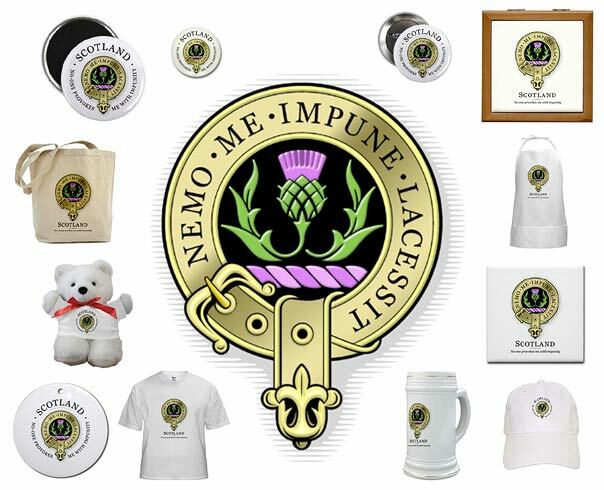 In the motto "No-one provokes me with impunity" (Latin: "Nemo me impune lacessit"), "me" was therefore originally the thistle itself, but by extension now refers to the Scottish crown and the Scottish regiments which have adopted it. The Order's primary emblem is the thistle, the national flower of Scotland. The motto is "Nemo me impune lacessit" (Latin for "No-one provokes me with impunity"); the same motto also appears on the Royal Coat of Arms of the United Kingdom for use in Scotland and on some pound coins. The patron saint of the Order is St Andrew. At Clan-Gifts.com we offer a wide range of quality Scottish gift Items, souvenirs, apparel and housewares, all printed with a beautiful rendition of Scotland's most loved national emblem, the Scottish thistle - otherwise known as the 'Flower of Scotland'! Our Flower of Scotland gift store stocks over 70 products*, and all items are fully guaranteed! Our great prices, low shipping costs and excellent customer support make us an excellent choice for Flower of Scotland merchandise!